Any truck that’s notched up two million kilometres must be a tough one, and any driver that’s spent seven years in that same truck must be hardy as well. 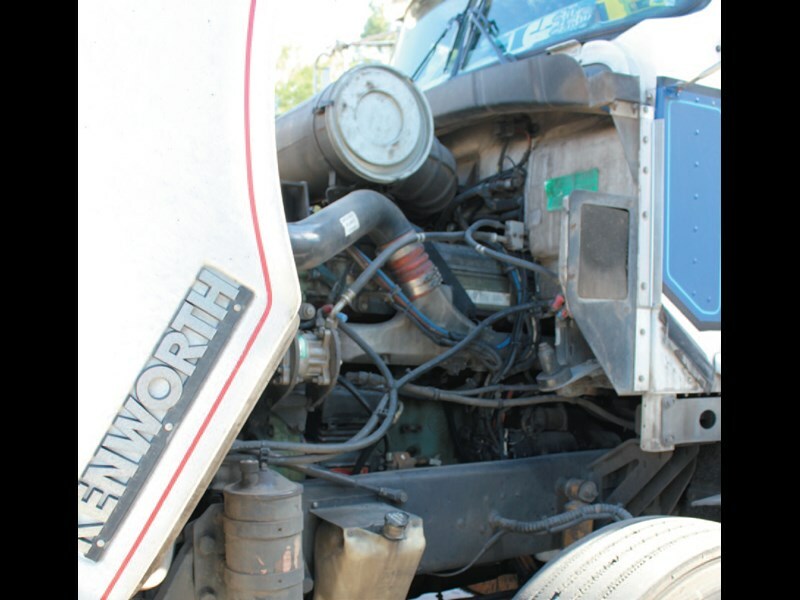 Both attributes apply to Allan Compton and his trusty 2002 T404 Kenworth. "It’s a good truck. I like it," says Allan, a man who uses words sparingly. "It’s fairly comfortable — not as comfortable as the European trucks, but it’s good. "The chap who owns it said it’s the best truck he’s ever had. It’s only in the past 12 months that it’s had its first rebuild." 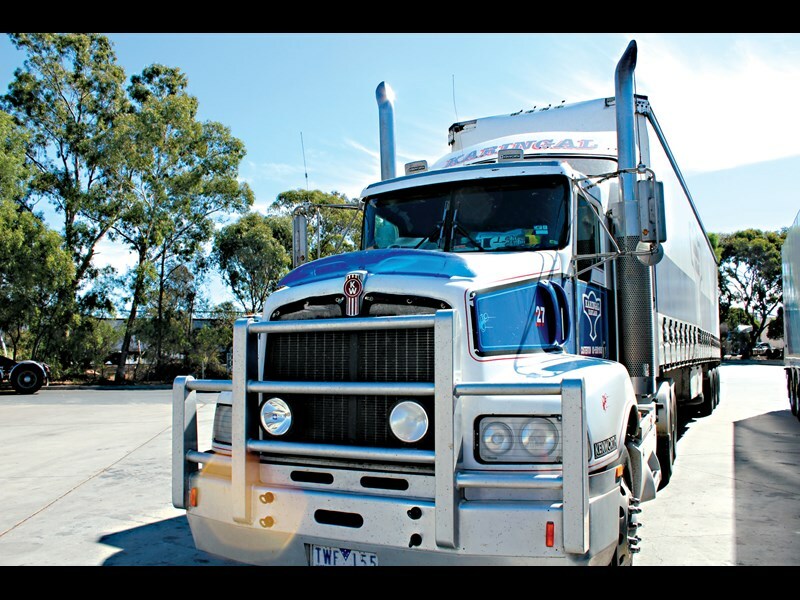 Allan drives for Karingal Haulage, based at Casterton in western Victoria. He tows a single Barker tautliner trailer, carting mainly timber out of Mount Gambier to Adelaide, Melbourne, Sydney or Brisbane and general freight back. Allan might only give the truck a wash every two or three weeks and he’s not into polishing, but that doesn’t mean he doesn’t like his old Kenny. 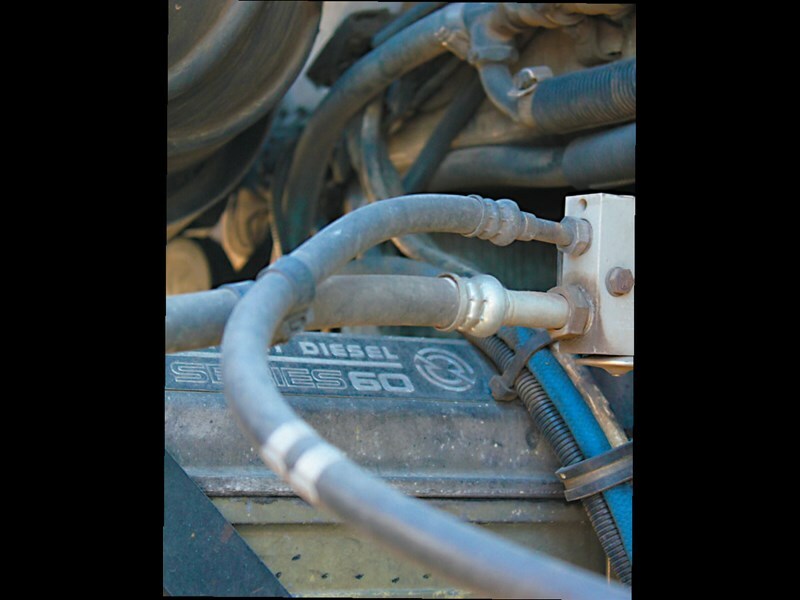 He says the 500hp (368kW) Detroit Series 60 engine has plenty of power for the job, and the truck is reliable despite its age. The T404 might have been on the road for a decade, but Allan’s been on the road for well over five decades — 57 years to be precise, since he was 20. That makes him 77 and still going strong, still doing interstate every day and some nights. When you’re away from home most of the time, as Allan is, your sleeper is important. It’s nothing to write home about but Allan likes the bunk in his 404. "I sleep better here than I do at home in the bed," he says. "I’m only home one or two nights a week, and the rest of the time I’m in here, it’s my home. "I usually drive during the day up until about 9 o’clock at night and then I go to bed. Then I get up at six in the morning." Allan’s bunk is big enough for his wife of 16 years, Masie to join him occasionally. "Now and again I’ll take her for a trip if it’s not hot," he says. "She likes to come for a trip." However, Allan hasn’t got a bunk airconditioner, but he says he gets by. "All I’ve got in there is a fan," he says. "I’ve got a little evaporative cooler at home; I bring that in summer time. You just fill it with water and plug it into the cigarette lighter." None of this is remarkable by today’s standards of course, but it’s a world away from bedding arrangements when Allan started out half a century ago. "There was no such thing as sleeper bunks," he says. "We would sleep under the trailer or if you had a low load on, you would climb up on top. "We had a little six by eight we used to cover our tarps with; we would tie that underneath the trailer like a hammock and sleep on that on a hot night. 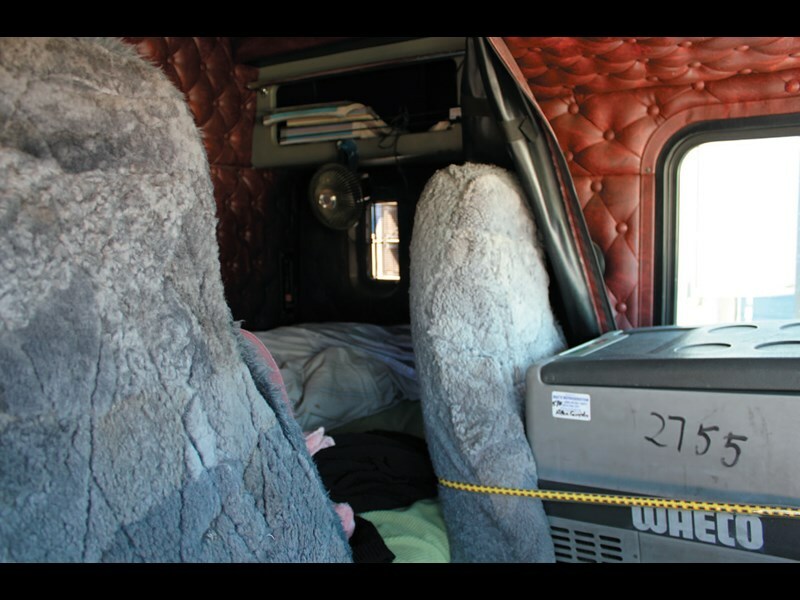 "In cold weather we would just stay in the truck and sleep with a pillow across the wheel, or if you were lucky enough to have a bench seat you’d just curl up on the seat. "If you’re tired enough you’ll sleep anywhere." Does Allan still enjoy the long distance trucking game? "Yeah, to a point," he says. "It’s not as good as it used to be. It’s not as much fun on the road. "In the early days if you had a flat tyre by the time you got the jack out someone else had the spare wheel, and someone else had all the wheel nuts undone, and when you finished and had it all done you’d sit down and light a fire and have a laugh and a few longnecks, and away you’d go. "In those days you could have a drink and the coppers didn’t worry us, as long as you did the right thing. "We used to get two days to go from Melbourne to Sydney and two days to come back again. The trucks weren’t as quick then." Neither did they drive overnight, but of course most of the roads weren’t as good either. Allan says things are a lot less relaxed these days. "It’s all rip, rush and tear now," Allan says. "Half the time they want their freight there before it even goes on the trailer." Nevertheless Allan says: "If I want to pull up and have a sleep, I pull up and have a sleep." When we caught up with Allan he was at the Wingfield BP in Adelaide where he was taking it easy with his son Jason. Allan has another two truckie sons, Dale and Stephen, of eight kids in total. Going back a generation, Allan’s father was a truck driver in the Army, in Palestine and Egypt in World War II, before returning to the family dairy farm at Portland, near Casterton. Jason drives a K108 Kenworth out of Melbourne for Zagami Transport, and has fond memories of riding around with his Dad. "I remember going with him as a little tacker in the school holidays and it was good fun and here I am today." Jason says Allan has tried and failed to retire a couple of times. "Good on him I reckon," he says. "Although I must admit as his son I do get a little bit worried about him out on the highway, especially at night." Both agree the industry is tougher than it should be. Says Allan: "I’m hoping one day all the freight will go to one big yard, and you just drop your trailer and go to bed, and someone unloads and reloads it for you, and they just come and wake you up in ten hours’ time and say ‘your trailer’s ready to go’, and you go." As for the ageing T404, Allan reckons his boss will "keep it for a while yet, but when I finish up he might get rid of it." So when will Allan finish up? "My plan is three years’ time, when I turn 80."